I played Z's CS-15 for about 15 minutes, after spending 20 minutes trying to figure out where the f**k everything was. As evidenced by the audio clip of the session, I mostly only found the highpass stuff of any interest. It's really just too sterile sounding to me. Didn't really feel encouraging enough to explore it any further. This post has succeeded in scaring me away from even considering an MS20. Boy oh boy oh boy, this kind of thread is a harsh reminder of how much of a newb i am when it comes to analog synthesis. Beyond of all this discussion, a simple piece of evidence proves how much the MS-20 has suffered from the hype : Korg's legacy collection mini MS-20 replica. I mean, for all the hype there is, what other synth has been reproduced in a smaller, cheaper, much more fragile and empty (it's a controller.) format? I think it shows how the MS-20 has become something of a fetish. I couldn't possibly contribute to this thread with a comparative argument about the MS-20 and CS-15, because they're just different synths in the end, and even though AG has made a very very clear (and lenghty mind you) point of the technical superiority of the CS-15, it's all a matter of taste in the end. I sold my M500 for a surprisingly good amount of money (sold it for 500$ CAN to someone who never saw it elsewhere than in a shop in NY that was asking 800$ US for it...ridiculous really), and ended up hesitating between the CS-5 and CS-15d. I decided to get the CS-5 because i wanted something else than presets. AG just made me realize i should've bought both, and engaged on the somewhat short road to loosing my girlfriend to vintage synths. In the meantime i think the CS-5 will be a good way for me to learn more about analog synthesis and i'll try to focus my interest on string machines to prevent spending all my money on a minimoog and a cs-15. Solderman wrote: I played Z's CS-15 for about 15 minutes...It's really just too sterile sounding to me. I'm quoting myself in an old thread because I've since bought a CS-15 for a great price. It's definitely on-chip sound with clean upper-harmonics, but I can hear a very slight oscillator drift in mine. It can sound very sweet and gooey soft, gets a bit harsher with resonance, and doing the feedback loop(use highpass on channel 1) can make it aggressive. Lots of timbre potential with the parallel filtering, as has been mentioned. It doesn't quite have the parallel filtering potential of, say the MaxiKorg 800dv, but you can approach it. VCO Sawtooth is louder than Rectangle, which is kind of unusual. I was generally disappointed in bass, compared to using an MF-101 pedal with the SEM or Kraftzwerg. It sort of loses steam below 90 hz or so, with no growl or rumble at all, just a muddy hum. Great EBM/industrial-type basses using the feedback loop, though. I can't say it's as flexible as some are claiming. As mentioned in this thread, no oscillator sync, even though it's pretty much set up for it, and no filter self-oscillation, typical of multi-mode. Also though, there is no adjustment for VCF keyboard tracking, the LFO has no square wave and can't trigger the envelopes like the audio input can, the LFO destinations have attenuators but no waveform-select for each,(like the CS20M/40M) there's no real way to set up a single control for vibrato depth of both VCO's,(ie. no modwheel) both CV and Gate inputs are incompatible with the standard types, there's no external CV input to control each filter's cutoff, the max LFO rate is fast, but not fast enough for typical ringmod sounds without Don Solaris's modification, and finally, there's no oscillator crossmod or VCF frequency modulation from the oscillators. The envelopes are pretty fast, but not Pro~One or Minimoog fast. It does not sound nearly as bright as my SEM at full filter cutoff, but that's probably asking too much. It really delivers the twang with the bandpass, especially in parallel with lowpass on the other channel. I've found some inspiring sounds with it and it should get some use after I re-cap it. It's also producing faint ground-hum without a two-prong power outlet adapter, so the chassis grounding may need looking at. It's a nice sounding monosynth with lots of sonic potential, despite the shortcomings listed. We'll see yet if it stands the test of time. xpander wrote: for shame! 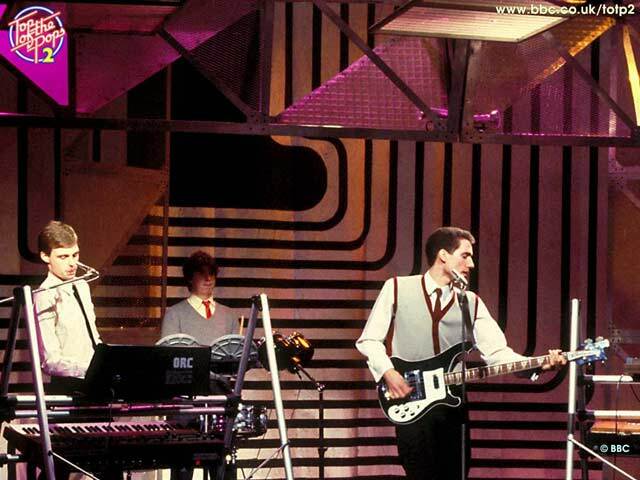 early OMD is essential listening, Dazzle Ships, Architecture & Morality, the first album... i guess they actually used an ORC MS-20! Check out the last issue of Future Music. John Foxx is playing some dates with a stage full of synth p**n. The FM DVD has a small movie looking at his live rig for these concerts. and I am picking up a CS-10 to add to the hz/v goodness. CV feed to the other MS-20K slave. Then the CV will be attenuated 2:1 to feed the two Monotribes and the new CS-10. Sometimes you have to work with what you have stumbled across! it was only recently that i started liking the cs15 and now i totally love it. we bought one for what we thought was a good price not too long ago, but after all the work it required to get it fully functional, we definitely paid too much for it.